Georgia DOT plans to install a dangerous "Suicide Lane" on Forest Hill Road from Wimbish Road to Northside Drive. 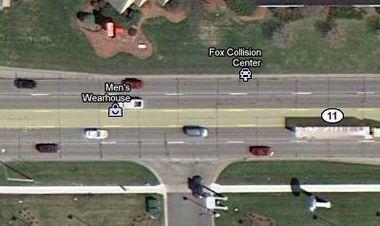 "The yellow car should have gone through the turn lane and in to the traffic lane when coming off of the side street. The center lane, unless marked differently , is solely to decelerate for a left turn. The yellow car is in violation." Subject: RE: Traffic Laws for Continuous Left Turn Lanes ? Georgia DOT's Most Dangerous Facilities? Maybe they would be safe then. I have been asked by members of the Macon Police Department to try to educate citizens on traffic laws. With the editors permission, I will try to do so. There are a number of streets and highways in Middle Georgia that have a center deceleration lane. This lane, which is marked by solid yellow or broken yellow lines, is in the center of the street and is solely to slow down to make left turns. A motorist desiring to turn left should proceed to the turn lane just prior to making a left turn. They may enter this lane no more than 300 feet from the location of the left turn. Georgia law prohibits the use of this lane for any purpose other than making a left turn. In other words, drivers are not allowed to use the lane for acceleration. They can be ticketed if they pull out of a parking lot and stop in the lane waiting for a break in traffic or if they pull into the lane to pick up speed to merge into the regular traffic lane. Finally, when a common turning lane is provided for vehicles traveling in both directions, drivers should use extreme caution before entering the turning lane to make a left turn. There may be a vehicle traveling in the opposite direction entering the turning lane to make a left turn. This is especially problematic in congested areas. There have been some problems on Gray Highway, Forsyth Road and Pio Nono Avenue. Police will be watching these areas, so do not be surprised if you are cited for this violation. This is the Georgia Code Section. Whenever a highway or roadway has a central lane in which traffic may enter from either direction for the purposes of making a left turn, no vehicle shall be driven into such central lane except for the purpose of making a left turn, and no vehicle shall enter into such central lane at a location which is more than 300 feet from the location where the vehicle will turn left across one or more lanes of oncoming traffic. No vehicle which has been driven into such a central lane shall be operated in such central lane for more than 300 feet. HISTORY: Code 1981, § 40-6-126, enacted by Ga. L. 1997, p. 866, § 1. In 2010 Macon, GA had the highest rate of pedestrian deaths in the state and much of it can be attributed to these overly wide, three and five lane roads which offer no safety zone for pedestrians. The middle lanes of these roads are known among professional transportation engineers (but not those associated with, or being paid by GDOT!) as “suicide lanes” and Judge Faulkner’s explanation offers one of the reasons why. There is nothing wrong with a properly placed and designed 3 or 5 lane road, but the numerous ones we have in Middle Georgia rarely fit that description. Numerous studies have shown there are better and safer designs available and most progressive cities are building them instead of the “traditional” 3 and 5 lane roads. 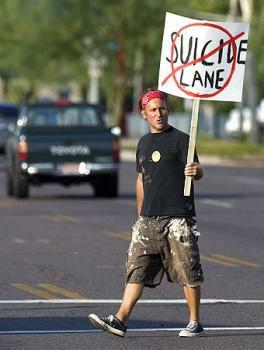 In fact, many cities that have suicide lane roads are now removing them. Maybe they would be safe then. But people do Not understand how to use them. Not even the Georgia DOT Chief Engineers! 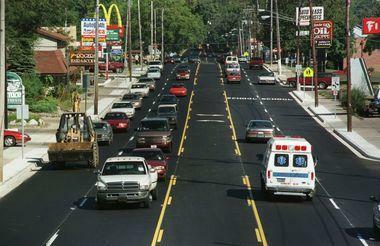 Traffic talk: Can drivers use the center left turn lane for merging with traffic? This week's traffic talk deals with a topic I get A LOT of questions about. When I say a lot, I mean that at last count I had no less than 20 emails and comments from readers asking me to clarify the rules for using the center left turn lane for merging with traffic. "Here's one for your column: Using the center left turn lane for merging with traffic. Scenario: a vehicle wishes to enter traffic which requires a left turn. The road has a a center left turn only lane. Action: The car first pulls into the center left turn lane, then either stays stationary and merges when clear or gradually increases speed to merge. I always though the center left turn only rule prohibited this action." Is it okay for motorists wishing to enter a roadway by taking a left turn out of a driveway to turn into the left-turn lane and cruise/get up to speed and wait for an opening before merging right? I think not. What if I wanted to turn left from the main road into a parking lot but there was another car driving down the center left turn-lane wanting to merge right, into my lane? It is my understanding that one must wait until traffic from both directions clear completely before making a left turn out of a parking lot/driveway so they can go directly into the driving lane and not the center turn lane. My co-worker, Jeff Haywood, first asked me about this six months ago AND he even sent me a Google Earth road sceenshot to illustrate his point. Of course I went to Michigan State Police traffic law expert Sgt. Mike Church for clarification. This was one those questions where Church said he immediately knew the answer. "It is not legal to use a turn lane in that way," Church said. "The hard part is explaining why it is not legal," he said. "Trust me, if this is a difficult question for me then it will be difficult for the general public." That e-mail said, "[W]hen I developed that course and taught it for MSU, I clearly advised that the left turn lane was not available as a merge or acceleration lane, and is only available for use by vehicles for a reasonable distance in preparation for a left-hand turn from an adjacent lane... The tricky part of all of this is that this is not specified in the Michigan Vehicle Code but is found in the Michigan Manual on Uniform Traffic Control Devices (MMUTCD) and applied to the Michigan Vehicle Code through (this section to this section)." The Michigan Vehicle Code does not say whether driving in the turn lane is allowed. But, Church said, the vehicle code does say the MMUTCD determines what signs, lane markings, etc. mean. And, under the MMUTCD, driving in a turn lane is not allowed. To make matters worse, he said, the MMUTCD is 836 pages long, and written for traffic engineers. "In other words, it is a technical manual that is not easily accessible to the public," Church said. "I can e-mail you a PDF of the MMUTCD, but it certainly is not enjoyable reading," he added. Yeeeeeah. I really don't think I'll be reading that anytime soon. I'm just going to choose to believe Cook and Church know best. So, to recap. It is illegal to use the center turn lane to merge with traffic. Please don't ask me to explain why (see above complicated answer). And finally, just so you readers know, this is the last time I will be posting traffic talk. You'll still be able to get your traffic talk fix, as the plan is for this MLive feature to continue. It's just that my replacement is yet to be named. In the meantime, this is me signing off. I have enjoyed answering your questions and learning new things right along with the rest of you. Thank you so much for reading. If you see a lane in the middle of a two-way street marked on both sides by two (2) lines — one (1) solid outer line and one (1) broken inner line — it means this lane may only be used for left turns. Drivers traveling in either direction must use this lane to begin their left turns, and drivers entering the road may also use this lane to end their left turn from a cross street before entering the traffic stream. To a cop, everything is illegal, and there are no victims, only suspects. Wrong person to ask. Also, this is largely a fault of the poor road designs used in Michigan. Boulevards divided by a raised bed with vegetation and LEGAL U-turns at the lights, combined with smart light technology, are the way to go. No way to make a left except at a light. 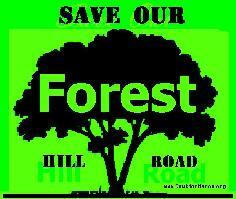 It improves traffic flow and safety dramatically. Of course, Michigan is 50-years behind the times in traffic light technology, and it takes 5-10 years of fine tuning to get smart lights working perfectly, so, maybe in 100 years we'll see some improvement. It is very unnerving for me to make a left on these busy multi lane streets , so unless there is a big hole were I can make hard left I try to avoid it . I have been known to go right , then left ,then back right , now.... some may think I am a doddering old man for doing this but I keep up with traffic once I get going in the direction I want to go. It is called a LEFT TURN LANE---- for a reason. Ok, we'll see. I've never heard of anyone being cited. I'll take the chance and save a lot of time, for myself and for everyone behind me. I've done that "stunt" thousands of times with no problems. i find an easy way to look at it is ; it is a left turn lane, if you aren't making a left-turn then keep out of it . . .
Greeby, you put a lot a faith in other drivers that may or may not come from out of nowhere when you perform that stunt. when you get ticketed for improper lane use, don't cry. with arrows clearly showing "left turn" along with that little sign that says "center lane left only", you're are wrong and I hope you get cited and don't hurt anyone in the process of you ignorance. Nice to see our laws are clearly written and accessible to the people whose behavior they regulate. It's illegal, but I can't explain why. Sounds like some of that Patriot Act nonsense. There should be a distinction between using the left turn lane for ACCELERATING and merging into traffic, and merely sitting there waiting for traffic to clear up so you can merge right. It sounds the like expert in the article says that it is illegal because you aren't allowed to DRIVE in that lane. Cruising down the lane at full speed waiting for an opening seems like a terrible idea, but sitting there waiting for an opening seems fine to me. That's because "Lazy Lefts" are MOST hazardous when the merging car is in motion and therefore warrant the most attention. However, sitting there with your right turn signal on also represents a hazard and is also illegal in Michigan. The problem in both cases is that the primary concentration of the merging driver is at their rear when the center left turn lane is used for bi-directional traffic. There have been plenty cars of executing a legal left turn out of the center lane get nailed by a stopped merging car in the center lane who, seeing the same opening, guns it while still concentrating over their shoulder. The bottom line is that it's a "Left Turn Only" lane in Michigan and not a "Mostly Left Turns, But If You're In a Hurry and Need To Pull Out and Stop and Merge Right Then That's OK Too" lane. "Why is it so unclear?" I agree, and I don't understand the sentiment that this law can only be known if you know the MDOT "secret handshake" or went to law school. I enjoy the comments from people saying that using the center left turn lane is the ONLY way to make a left onto a busy street. I can't say I've never violated traffic laws, but this is one area that I won't make an exception on. I don't do it, and I've never been stuck for more than a couple of minutes waiting for traffic to clear. You can tell yourself there's no other way, but it's not true. You're just impatient. I think that the communities have a responsibility, then, to make sure that the roads and signals increase as traffic flow increases so that people CAN make a left turn. In some roads, there is literally NO opportunity to get a clearing because of the way traffic control devices are set up. Using the left turn lane as a merge lane from making a left turn is not legal, end of story. That isn't to say that it isn't done. However, ask any police officer what would happen if said person from said left turn lane were to cause an accident by either merging at the wrong time or attempting to curse to get up to speed and running into a motorist who is making a legal left turn. I can tell you that I know for sure who's going to get a ticket out of that incident every single time. The left hand turn lane is for turning left. Simple as that. This is so typical. Why can't they write laws in easy to understand straight forward language. What should be so simple; center turn lane can not be used as a merge or ecceleration lane, is instead buried in an engineers manual. They say ignorance of the law is no excuse but if you give me a driving manual, tell me to learn it and then write me a ticket for not following a rule written in another code book I don't even have access to is a bit unfair. It isn't "buried"... If you look on page 70 of the "What Every Driver Must Know" booklet published by the SoS's office for people wishing to get a MI driver's license it addresses this issue: "Never use a turning lane as a merge lane to pull out into traffic or to overtake and pass other vehicles." "The hard part is explaining why it is not legal." Really? Visualize someone using it illegally as acceleration/merging lane meeting up with a car heading in the opposite direction trying to use the lane to make a legal left turn. Don't see a problem there? Or, how about a car wanting to merge into the lane to make a legal left turn but cannot because some schmuck next to them is using it as their own personal acceleration lane? animations of incorrect usage of the Suicide Lanes.? The On-Line Traffic School, Inc. is teaching seriously WRONG?